Hey everyone! 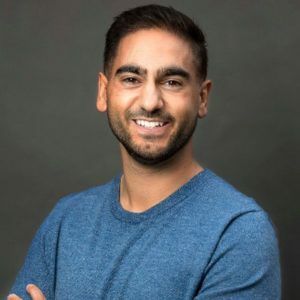 In today’s episode, I share the mic with Alex Banayan, the author of The Third Door. Tune in to find out how Alex got to be featured on Forbes’ 30 Under 30 list, to hear the life-changing advice given by the President of Microsoft and to learn how a public speaker can make up to $100,000 per event. [00:52] Before we jump into today’s interview, please rate, review, and subscribe to the Growth Everywhere Podcast! [02:15] Alex had a life crisis while at USC, because he was highly-pressured by his Jewish immigrant parents to become a doctor. [03:05] He felt as if he was having the life sucked out of him and realized he wasn’t on his rightful path. [03:35] Alex assumed there would be a book with a focus on the life stage where you are trying to launch your dream. [04:00] When he realized there wasn’t a book, he figured he would write it. [04:45] On Facebook, someone was offering free tickets to The Price is Right. [05:00] Alex figured he could win money on the show to fund his book, even though he had never even seen an episode of the show. [06:20] He went on the show and won a sailboat on the Showcase Showdown. [06:25] The sale of the boat funded his book. [10:52] In writing his book, Alex was able to conduct a lot of interesting interviews. [14:02] Alex spoke to people from all areas of life and it has been a “fun adventure” him. [14:30] Alex understands that marketers have to deal with a lot of rejection. [16:20] Alex recounts his coincidental meeting with Larry King. [22:45] The best advice Alex received was from a man who grew up in a very rural, very poor area in China and then became the President of Microsoft. [23:20] This man believes luck is like a bus: If you miss one bus, there will always be another. However, you need to be prepared and have bus fare. [26:25] When you have a successful book, your speaking fee can be around $20,000. More established authors can make $100,000. [28:50] Alex has been on more than 60 podcasts in the last year thanks to the success of his book. [29:48] Practicing your speeches is key to success as a public speaker. [30:25] There are ways to learn how to be a good storyteller, but practice is the biggest part of that. [31:05] There are two critical elements to every story: relatable origin and conflict. [34:18] Alex recommends the book When Things Fall Apart. What should I talk about next? Who should I interview? Please let me know on Twitter or in the comments below. Disclaimer: As with any digital marketing campaign, your individual results may vary. Eric Siu (@ericosiu) is the CEO at Single Grain, a digital marketing agency that focuses on paid advertising and content marketing. He contributes regularly to Entrepreneur Magazine, Fast Company, Forbes and more. Subscribe now and get access to more of our entrepreneurial interviews so you can start growing faster. I consent to email messages from Growth Everywhere. Growth Everywhere © 2019. All Rights Reserved. The frameworks we use to grow our clients’ (and our own) websites to 50,000, 100,000, 1M, even 45M visits per MONTH! Wait, you forgot to sign up! Don't miss out - we'll share tactics from the exclusive inbound marketing playbook that gets us millions of site visits and Fortune500 clients.